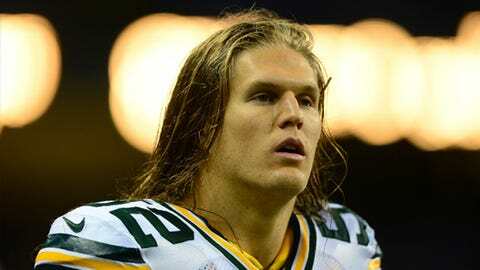 Packers star Clay Matthews has been the subject of more trade talk of late. A: In the NFL, you always want to get in the playoffs, even if a team barely sneaks in — like the Packers would this year if they overcame the odds to make it. Unlike the NBA postseason, where a seven-game series typically means the better/higher-seeded team will eventually win, the NFL has had too many examples of wild-card teams getting to — or even winning — the Super Bowl to ignore it. If you’re a Packers fan, you should want them in the playoffs because anything can happen when every game is a win-or-go-home situation. Now, if the team were to, for some reason, bring Aaron Rodgers back from his broken left collarbone too soon in an effort to make the playoffs, then it’s reasonable for a Packers fan to hope they lose now in order to preserve the future (a.k.a. Rodgers). But thus far, the Packers have been patient with Rodgers, even when faced with a must-win game this past weekend against Atlanta. As long as Rodgers doesn’t get injured any further this season, Green Bay’s future will stay intact regardless of whether they make the playoffs this year. A: It’s one of those ideas that might sound crazy at first glance, but if the return in a trade is right, it’s something that should be considered. Clay Matthews is having the worst season of his career, but he’s still one of the NFL’s best pass rushers when healthy. The broken thumb that he suffered in Week 5 derailed his season, but he wasn’t having a Matthews-esque start to the season even before that. After signing a five-year, $66 million extension last offseason, Matthews is under contract through the 2018 season and due a ton of money between now and then. So, where would his trade value be at right now across the league? The Packers have found out this season that they’re a top-heavy team in that they have one superstar player (Rodgers) but not enough talent around him to continue winning without him. If Matthews would bring in a huge haul of early-round draft picks for Green Bay, it would be enticing for general manager Ted Thompson. I’m not suggesting that the Packers should trade Matthews, but perhaps it’s a way to help replenish the rest of the roster — if Matthews’ trade value is still very high — while also getting out from under a contract that, at least through its first year, seems like too much money based on his 2013 production. A: Sam Shields should be priority No. 1. He has improved every season, and cornerbacks coach Joe Whitt loves Shields’ work ethic and attitude. He’s never going to have the ideal cornerback frame, but his ball skills are about as good as it gets. If the Packers lost Shields in free agency, and with Tramon Williams being 31 years old next season, they’d be expecting a ton out of Casey Hayward, Davon House and Micah Hyde. I think Mike Neal and Johnny Jolly can be brought back on very team-friendly contracts, and if that turns out to be true, I expect them back in Green Bay in 2014. Evan Dietrich-Smith will probably be back, but the Packers could go with JC Tretter at center if negotiations stall. You didn’t include James Jones, and I think he’ll be re-signed. There’s not a big market for a 30-year-old wide receiver, so Jones will likely want to stick around with Rodgers for a couple more seasons. If the contract is right, the Packers should want him back, too. That you didn’t include B.J. Raji and Jermichael Finley on your list is probably going to be true. I think Raji will be playing elsewhere next season and it’s difficult to tell if any team will give Finley a chance given his neck surgery. Andrew Quarless will likely be back. A: Speaking of Quarless … No, I don’t think he has the talent to ever reach "elite" tight end status. He can’t be Jermichael Finley. Quarless just doesn’t have those pass-catching skills. Even Finley wasn’t elite, but he had the ability to become that. Quarless will probably max out as a very good No. 2 tight end on the Packers or a solid fill-in starter like he has been this season since Finley’s injury. Brandon Bostick can also become a good pass-catcher, but like Quarless, he too doesn’t have that elite-level skill. Tight end is a position that Green Bay will need to address in the early rounds of the draft if they hope to add a player with comparable talent to Finley. A: I disagree with a couple of those draft needs, Bob. I do agree with safety — that should be Thompson’s No. 1 objective in the draft. I also think drafting a quarterback in the middle rounds could be smart, but only if the coaching staff is convinced that Scott Tolzien can’t be their backup solution for the next couple years. But cornerback and defensive line are two of the Packers’ deepest positions, as they’ve invested heavily at both of those spots in recent drafts. Even if the Packers lose Raji and Pickett this offseason, Mike Daniels, Datone Jones, Jerel Worthy and Josh Boyd are all young and will be depended on heavily. At cornerback, assuming they re-sign Shields, adding Hayward back into the mix after an injury-plagued 2013 season, plus seeing if Hyde can make the typical Year 1 to Year 2 jump, that should be a deep group still. I don’t think it’s too optimistic to think that players like Bostick, Quarless, Sean Richardson, Derek Sherrod and Tretter can become consistent contributors. Each of them has what it takes to be key role players for several years. With as young as the Packers’ roster is, a big factor in how they do every season is in how well the young players — like the ones you listed — develop. If they make the jump that Mike Daniels made, everything works well. If they fail to make the jump like Jerron McMillian, you see a position — in this case, safety — be exposed as a significant weakness because of the missed draft pick. A: It could change as the week goes on, but as of Wednesday night, Cobb has still not been medically cleared. He is eligible to return from the injured reserve designation for Sunday’s game at Dallas, but Cobb is still not even practicing, so him playing in the next week or so is unlikely. ** Thanks for the questions this week. We’ll do it again a week from now to break down the Packers-Cowboys game and look ahead to Packers-Steelers.